Best Running Tips Newsletter, Issue #031 -- We Have a Gymboss Winner! So, last week we did a Gymboss contest. There were lots of "likes" and comments. In the end the winner was picked out of a random draw. The winner is Elizabeth D.
Congratulations, Elizabeth, you know who you are, please contact me via the site and I'll arrange with the guys from Gymboss that you get your Gymboss in the mail very soon. Also, winner of the previous contest Cheryl B-L, please contact me via the site so I can get you your book "Run Less, Run Faster". As I found out, the drawback of having these competitions via Facebook is that I can't contact prize winners. Next contest we do, I'll have to find a way around that. 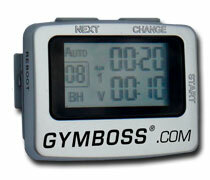 The Gymboss is really a very handy little gadget to have. It is really inexpensive and earns its price back in gold every time you do an interval run or a run/walk workout. I am currently in a long base building period in preparation for a June marathon. There are different ways people do their base building. For some it means absolutely nothing faster than easy pace. For me it means that most runs are done at easy pace. But I also do a once-a-week tempo run and play a little bit with the pace in other runs. The fastest I'll go in the base building period is tempo pace. But I also do longer runs at tempo pace + 20 sec/km for example. I'll keep this going until about February, at which point I will start adding interval running into the schedule. The purpose of the base building period is to build up endurance. Some find it boring and they can't resist to add some speedwork. I like it. Interval sessions are not my cup of tea and I get a better chance to enjoy my runs when I am not in race-prep mode. Today was a "tough day in the office" though. I had some time in between dropping off and picking up my son from a birtday party and decided to go for a 60 min run. On another note: don't you love it when they get to an age at which you can just leave them at the party! Beats having to make polite conversation with other parents who are also bored numbless. Anyways, here in Australia spring has just started. Today was one of those days on which it was fairly windy, but the sun was out in full force. I got hot very quickly. The last 10 minutes of the run were a real, real drag. Can't remember when I last drank so much water after a run, I was completely done for. Check out the running training section of Best Running Tips to learn more about base building, tempo running and periodization, all important components in a running program. The Running Training Helpline is getting clogged up with questions. It's a bit of a victim of its own success, at the moment. There are about 25 questions waiting and they are arriving faster than I can work through them. So, calling all volunteers! Now, if you know a lot about running, have a knack for writing and wouldn't mind helping me out answering 3-5 questions per week, then do not hesitate to hit "reply" now and start telling me why you'd be good at this! Although we don't celebrate it here, Happy Halloween to everyone who does celebrate it. In the meantime, come visit my site often and happy running!